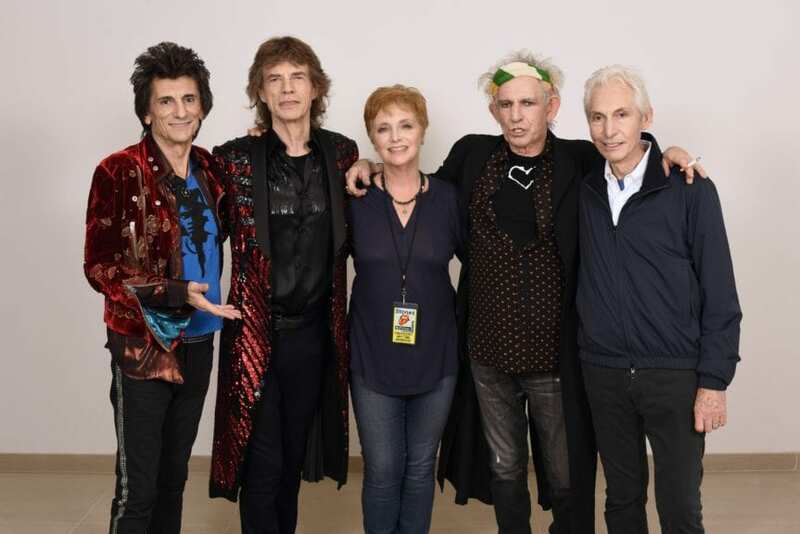 “I still wake up every morning and think, Crikey, I don’t believe I am doing this…” says Joyce Smyth, the current manager of the Rolling Stones. Smyth, a corporate tax lawyer, found herself in 2010 as the manager of the “World’s Greatest Rock n’ Roll Band,” the moniker the Stones were crowned with in 1969 after legendary performances at Hyde Park, Madison Square Garden, and at Altamont Speedway. In the 1990s, as senior partner and head of client development at the law firm, Joyce Smith assumed a larger role in handling their business affairs as their supervisory director. This decade saw the Rolling Stones rejuvenate themselves as they embarked on three mega world tours (’89-’90, ’94-’95, & ’97-’99) that saw them play in new countries across the world with elaborate stage sets, and they recorded two new albums, one of which, Voodoo Lounge (1994), won a Grammy award. Smyth broke off and started her own firm as Theodore Goddard shifted their focus to mergers and acquisitions because she wanted to continue her work with individual clients in the entertainment field, so she continued to work with the Stones. In 2010, Loewenstein retired for good and Smyth officially took the manager title. Smyth’s first objective as manager was planning for the Stones’ 50thanniversary in 2012. Mick Jagger and Keith Richards, unsure themselves if they still had it in them to perform at the level they expected because they last performed live in 2007, orchestrated rehearsals in the fall of 2012 as if they were to embark on a 100 show world tour. But in fact they were only going to play two shows in London, one in Brooklyn at the Barclays Center, and two at the Prudential Center in Newark, NJ. They surprised themselves as these shows were a massive success to commemorate their 50thanniversary, and this lead to a new era of the Rolling Stones. They would go on tour each year since – ’13, ’14, ’15, ’16, ’17, and ’18 – all highly successful tours that saw the Stones tour the globe and headline the Glastonbury festival, return to play at Hyde Park, perform the Sticky Fingers (1971) album in its entirety at the Fonda Theatre in Los Angeles in 2015, and play a once in a lifetime concert in Havana, Cuba in 2016. Also, they returned their roots in 2016 and recorded Blue & Lonesome, an album of blues covers that would also win a Grammy. According to Smyth, “It is true to say that the machinery operates in the background, but they’re very involved. The machine comes to them, I take things to them for discussion and approval.” The machinery she refers to is how closely involved Mick Jagger is involved with the business affairs of the band. He attended the London School of Economics, so he is familiar with how to operate a multi-million dollar company, which is what this band has evolved into after 55+ years of being at the top of the music industry. He and drummer Charlie Watts, for example have large roles in the stage design, marketing, and design of merchandise to be sold at each particular tour. “And most importantly, perhaps because of my legal background, I try to bring to bear objective and dispassionate advice, whilst trying to be fearless on their behalf when it comes to negotiating deals,” says Smyth. This holds true when trying to negotiate with government officials in Cuba to set up the extravaganza concert, or their concert to 1.5 million people in 2006 at Copacabana Beach, Brazil. Other duties of Smyth include managing the copyrights to the Rolling Stones extensive music catalogue, which is somewhere like 30 albums and 300 songs since 1962.